Kitchen Design Think Tank: Cigar Smoke and Bikinis! 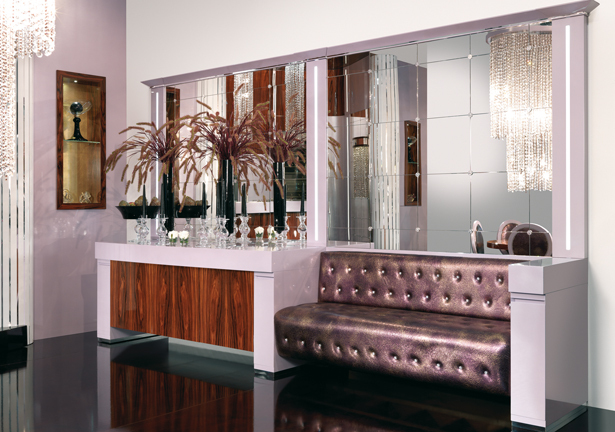 Stepping from your Learjet onto the melting tarmac and moving towards your air conditioned limo you long to get settled in your high roller Vegas suite! The Mogul believes that this is a fitting introduction for this little gem! 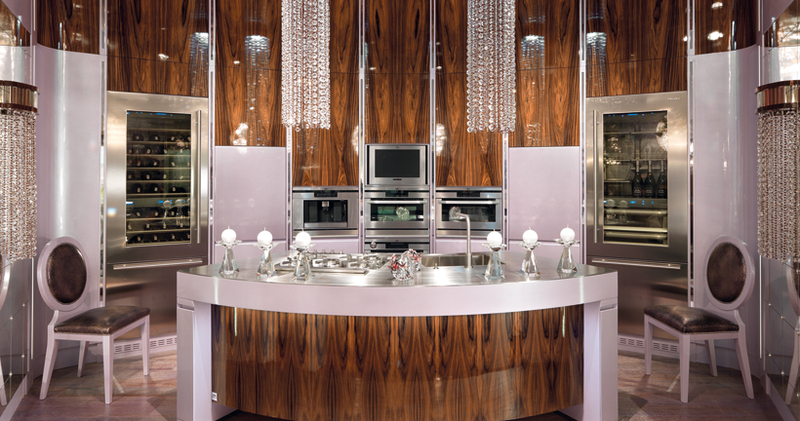 A kitchen that oozes opulence and a style that is more in keeping with a 1970’s mobster movie! You can almost visualise the flared trousers, big lapels and scantily clad hostesses moving through this space! There is everything here to impress, exquisite wood veneers, stainless steel, high gloss lacquers and mirrored panels, everything except thick cigar smoke and brandy! 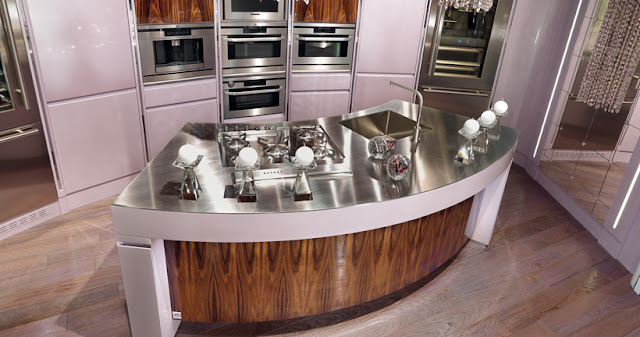 The Mogul loves this modern “step back in time” design and particularly how the veneered walnut panels along the back wall drop at various heights to meet the arsenal of modern appliances. This stepping feature is great and gives the design an extra layer. 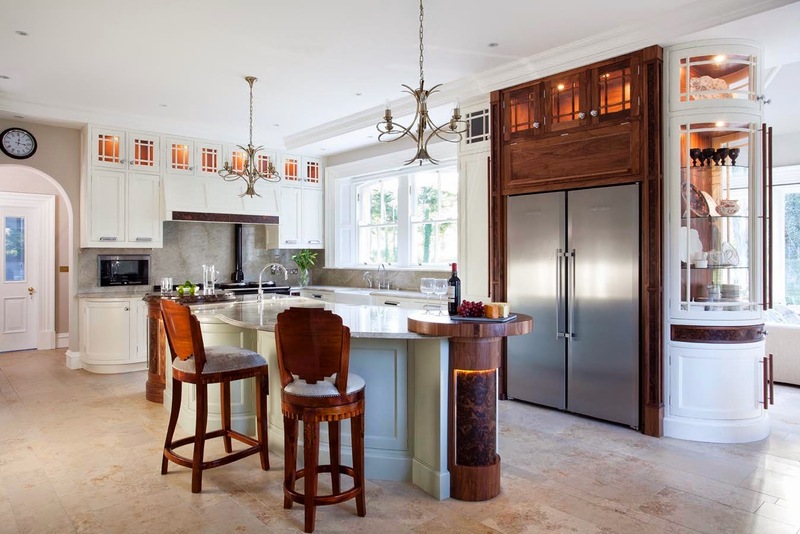 Notice also how the kitchen moulds itself into the space with tall concave doors making that effortless transition from kitchen to wall panelling on either side of the party evoking coolers!! The tall ceilings, stepped floors and dropped lighting all add to the WOW effect! The Mogul approves as kitchen, architecture, lighting and interior design have merged to create a fantastic space!